January 2015: Here are some spectacular photos of places to add to your travel list - and most of them are made by nature. October 2014: In a digital age, books are still as popular as ever. They are tangible; they can be shared; children can gather round them; and in the remotest part of our globe they provide access to information. Here's a great article about books...in the most unlikely places. September 2014: Are you a newbie in Dubai? Here are some of the questions newcomers are asking. Do I need a four-wheel-drive? September 2014: a tongue-in-cheek look at life in the UAE. September 2014: A beach is not just sand and water. Here's a great collection of interesting and unusual beaches. Even the names are poetic: Purple Sand Beach, Hidden Beach, Glass Beach (ok, maybe not the last one). September 2014: On the edge of the Nevada desert, is a hotel full of clowns. And I'm not talking about the patrons. The Clown Motel is decorated with thousands of them. But why? September 2014: Discovery is part of travel, and you don't even have to travel very far from home. This chap discovered a secret room in his house, which led to a tunnel, which led to a network of rooms, which led to an entire underground city. It's incredible. September 2014: If you think travel is about understanding your place in the world, you probably have a passion for maps. Here's a great one depicting the population growth in the US, from 1790 to 2000. Every map tells a story. September 2014: Travel gadgets can be fun and make your life easier on the road. But what's your view on these rather bizarre items? We'd love to hear from you. August 2014: Every summer the expat hubs leak foreigners as families flood back to the homeland. More often than not the husband protects his annual leave by remaining at work. Here's a fresh perspective. August 2014: How honest are you? The Department for Work and Pensions has issued figures revealing that 7,296 Britons abroad were investigated for benefit fraud totalling £82 million in the past year. August 2014: Moving to any country is a life changing event. But do you really appreciate what it has to offer until you leave? 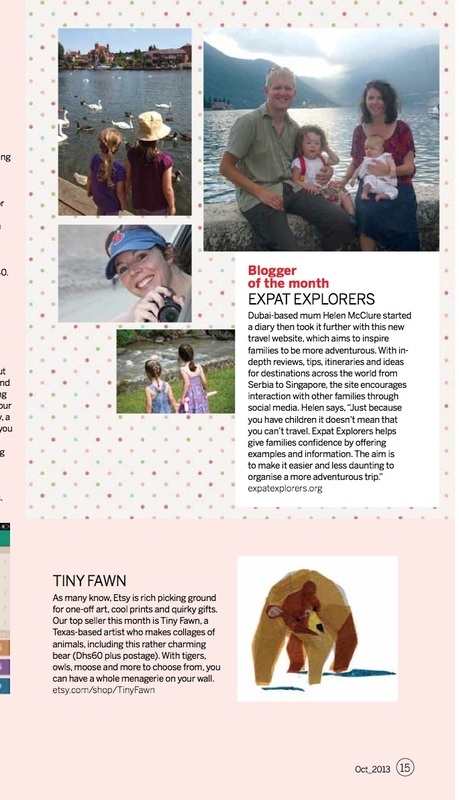 Here's a lovely article about leaving Singapore. August 2014: Who would you name as the most famous Briton? Who do foreigners see as the epitome of Britishness? Here are the Great Britons, according to the rest of the world. July 2014: Whether you're an expat striving to get to grips with living in a new place, or a travellers passing through, language is often the biggest communication barrier. When we moved to the US it took me a while to get to grips with zucchini instead of courgette, and eggplant instead of augbergine. Now where are those nappies, sorry diapers? The Lonely Planet has gathered some great examples, and we'd love to hear yours. 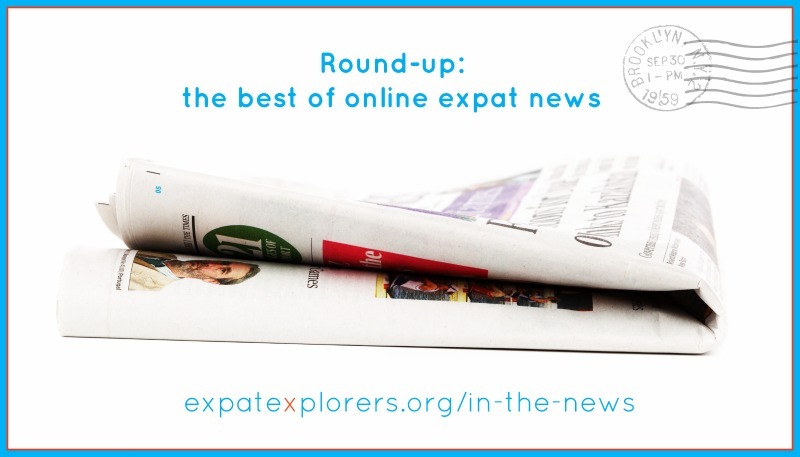 July 2014: Why become an expat? 5 million Brits now live overseas, searching jobs & sunnier climes. What's your motivation? July 2014: Every summer there is a mass exodus of expats heading for the homeland. However, worries about burglaries, pets and husbands forced to work are three of the biggest worries according to Expats Blog. What are your concerns? Expats Blog: UAE expats risk spoiling their holidays with practical worries. July 2014: I asked my four-year-old daughter what she liked about travelling and she said: "I like to see other children and how they go to school." Children are fascinated by children. They are all the same; the play, laugh and cry. But they are all different. Here are some great photographs to prove that. Bored Panda: 30 Magical pictures of children playing around the world. Sometime we need a little light relief - excuse the pun. May 2014: New research finds almost four in 10 British couples with children say they would consider moving abroad, with the hope of bringing their family closer cited as the main reason. Expats: what's your view? May 2014: If you live in Singapore you can claim that Bali is an easy weekend away, something that sounds out of place in London. So if you're lucky enough to pop across to Bali here are a selection of beaches to try. May 2014: The topic of Dubai appears to polarise opinion. Does it have culture or not? Is it too hot to go outside? Do you think it's a place a women can live comfortably? The Telegraphs attempts to stamp on some of the myths. April 2014: “Is Dubai the new Essex?” Is Dubai at fault or is it the tourists who give it a bad name? What's your view? Drop us a line. The Telegraph: "Is Dubai the new Essex?" April 2014: Thanks to Nino Gruettke, at Learn-Love-Laugh.com for sharing his happiness video of Singapore. Great vibe and representation of the city. March 2014: As expats we miss our families and friends from home, and love having guests to stay. However, there is a balance to be struck between being a good host, and getting sucked into running a hotel. Here's some tips from The Telegraph. January 2014: Why do we take photographs when we travel? As a record, to catalogue journeys, to give insight to future generations? These amazing photos do all of that, and have survived a century locked in a block of ice in Captain Scott's Antacrtic hut. January 2014: travel and photography shape how we see the world. These pic are pretty amazing. December 2013: To round off the year, here's a collection of funny travel stories from The Telegraph. If you want to know about bizarre Christmas traditions, or why you'd walk off a cliff, just read this. November 2013: I have a confession. I love maps. I even collect antique maps. It's the only way to travel through time. Here's some fantastic examples of an alternative way of viewing them. Every wondered what a map showings the etymological origins of various words would look like? November 2013: Do children benefit from being Middle East expats? There are many advantages to living in the UAE: great winter weather, supportive community, get primary education, cultural insights. The list goes on, and probably explains by the UAE was the highest ranked Middle Eastern country, and ranked 13th in the world, in the annual HSBC Expat Explorer survey. What about the disadvantages: inside living in the summer, growing sense of entitlement.... what's your view? Daily Telegraph: Bringing up children in the Middle East - yay or nay? October 2013: Should you send your expat child to boarding school? This is a debate that keeps going. Should you choose an international school or send your child home to board. Ultimately it depends on your circumstances, the quality of your local schools and whether boarding works for your family. We'd love to hear your view. expatsblog.com: Should expats children be sent to overseas boarding schools? October 2013: UK expat could soon receive the healthcare benefits of home. This is something that causes blood pressure to rise; British expats feel discriminated against as they do not qualify for free National Health Service care even if they have paid National Insurance contributions while they lived in the UK, even though it is available to immigrants as soon as they land in the UK. This could be set to change. What's your view? September 2013: Top tips for travelling with children. 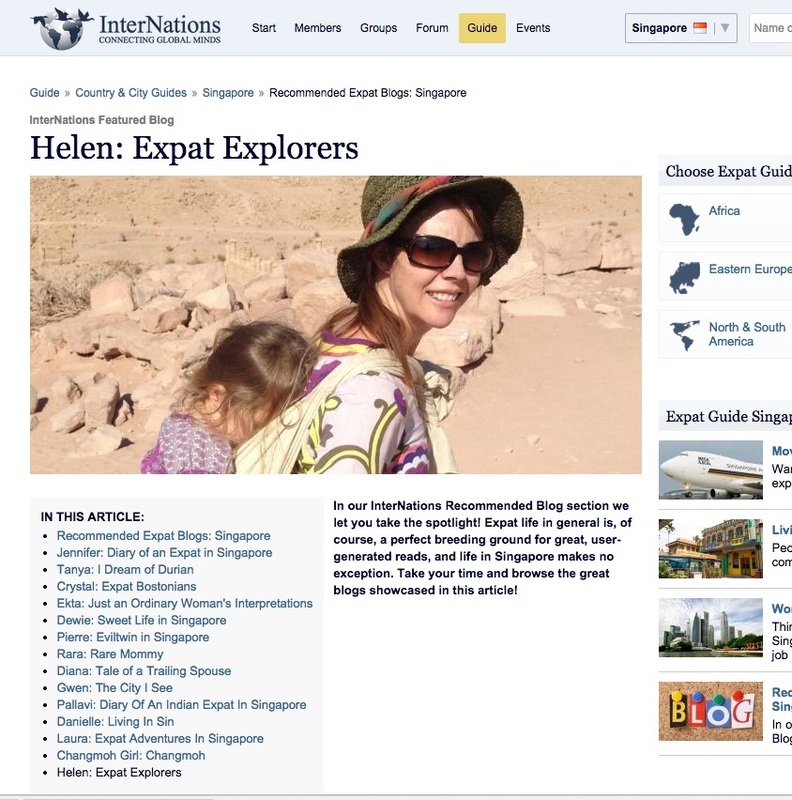 At Expat Explorers our main passion is to encourage families to travel. Yes, it's more difficult. Yes, it's more tiring. But there is a great wild world out there waiting to be explored, and beautiful memories to be created. Here are some great tips to make life easier. September 2013: Top tips for moving abroad. The UK Foreign Office is offering its advice to anyone who wants to move aboard. Top of our list would be: 1. Know the costs, 2. Integrate, 3. Give it a chance, it gets easier. What's your advice? If you're thinking of moving to Dubai we've got further insights coming up in the Expat Suitcase. September 2013: Home from home. When you move abroad there are some things you have to do without, and there are some things you can't. British expats apparently can't do without a good cup of tea and a dollop of Marmite. What else do you think is on the list and what do you miss from home? September 2013: 10 principles to makes your trip memorable. Slow down, be open to new experiences, be present and passionate. From advice on how to make your travels even more special. September 2013: Strange facts you didn't know about London. The main landmarks and tourist icons are famous. What about finding our about mass graves, plague pits and air raid shelters on your next visit? Thinking Nomads: Strange facts you didn't know about London. September 2013: Free entertainment in the USA. You don't have to pay with an arm and a leg to have a great time. And after the cost of flights theses days there is probably not much left in your pocket except a used tissue and a receipt. So how about checking some of the best of the freebies in the USA? Also a rather weird dog commentary about air travel! August 2013: Travelling in style v airport mayhem. The growth of private jet companies means air travel is stepping into its more glamorous shoes. But is this affordable for everyone? And what's the point when you feel like a pawn on the airport chessboard? Can a good bottle of wine and a comfy seat really take away the sour taste left by your airport experience? What do you think of when you think of Abu Dhabi? The corniche, the Emirates Palace or Saadiyat Island? Every time we visit there is something new to see and do. It's no longer Dubai's poorer neighbour. Here's a few ideas if you're planning a trip. Do you believe that life is greener on the other side? Is that why you became an expat? An independent survey of expats is attempting to answer this question through a rolling programme investigating migration and lifestyle, retail and finance and travel and health. If you'd like to record your views, click below. 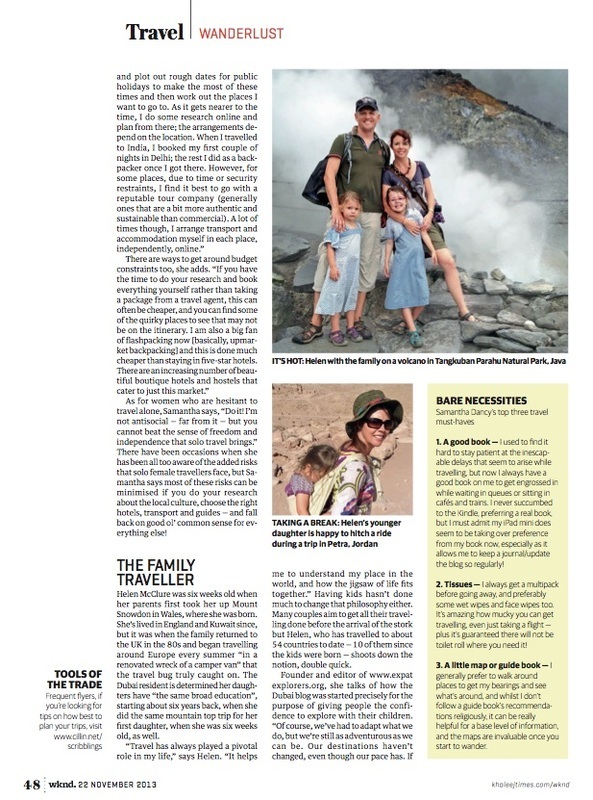 August 2013: What the difference between a traveller and an expat? It is a matter of attitude or how you live day to day? How long to do you have to live somewhere before you can call it home? We'd love to hear your thoughts. Click here to contact us. August 2013: Saudi and the UAE have emerged as the top job markets in the Middle East. This is despite expats fearing job security in light of policies to localise the workforce. August 2013: Wonders of the world? What would be on your travel list? Which modern structure will still in standing in the coming centuries? Which antiquities stand the test of time? We'd love to hear your suggestions. Click here to leave us a comment. Thinking Nomad: Five alternative wonders of the world that you have to see. August 2013: Three-quarters of all expat Brits would not return to their homeland, according to a survey conducted by financial advisory organisation the deVere Group. According to the Office of National Statistics, the number of British citizens who emigrate long-term has risen 8% in the last year. July 2013: Men dressed in straw, Pearly kings and queens, dancing round a May pole and tap dancing for worms are all strange British traditions. What's the strange tradition where you live? July 2013: Where is the world's most beautiful building? What's your view? Here's some from Lonely Planet. July 2013: Need to post a letter. You may find a post box where you least expect it. Where have you found one? July 2013: Heading to London and worried it will be heavy on the pocket? Here's some ideas of free things to do. July 2013: When I started travelling the only communication tools I had was a notebook and a film camera. Hasn't technology moved on? Here's 25 free iPhone travel apps to make life easier. Do you have any to share? July 2013: Travel gives us the opportunity to learn about different cultures, and dance is a part of that. Here are the top 10 local dances from Cheapflight.com. Our favourite is the Kecak in Bali. July 2013: Need some photo inspiration? What makes an inspiring travel picture? Colour? Juxtaposition? Composition? A memory? Take a look at the National Geographic's Travel photo competition for some awe-inspiring shots. July 2013: Coping with the fatigue of a red eye flight isn't easy. Here are some useful tips. If you're travelling with young children changing your clock to your destination's time and sticking to your routine is key. What's your advice? July 2013: Experienced poor service, think the quality of your hotel room is substandard, or simply have a fly in your soup? Here's how to write a complaint letter that gets noticed. This was picked up by Richard Branson and The Huffington Post, leading it to go viral. BVI Beacon "Open letter to LIAT"
July 2013: Where in the world are the rudest taxi drivers? A survey of UK holidaymakers, by airporttransfers.co.uk has put Paris and Rome to shame. But what makes a driver rude? Lack of knowledge, indifference, dirty cars, taking the long way round? How long can we make this list? June 2013: When you live in the UAE, the expat's holiday is a slice of home; green trees, the local pub, family nearby and, yes, even the rotten weather. Although fathers are often left to fend for themselves for a couple of weeks, the focus is on ensuring that children get to connect with their family and their roots. The Telegraph's Annabel Kantaria gives some insight. Telegraph expat: Why do expats mums and children go home for the summer? June 2013: Travel mistakes make memories, but it's hard to remember that when something goes wrong. Even the most seasoned travellers get it wrong. My husband once booked us a romantic two-centre trip to Venice and the Dolomites as a babymoon, just before our first daughter was born. But instead of booking the room consecutively he booked them for the same dates. And as Venice was hosting the film festival, there was no room for Mary at any of the 200 inns we called at 2am. Oh, how we laugh....now. Drop us a line to share your mishaps. We'd love to hear from you. Here are some from Lonely Planet. In the European awards the Great Cathedral and Mosque, Cordoba, Spain, took the top spot. The UK only featured once: Durham Cathedral. The winners definitely have a right to be there - there are some impressive sights, but surely the UK has more to offer? Travellers' Choice Awards top European attractions. June 2013: Petra in Jordan has been ranked the top Middle Eastern tourist attraction according to Trip Advisor. The Temple of Karnak in Luxor, Egypt, came second and the Abu Dhabi Grand Mosque came third. Ten out of the 25 awards went to Egyptian landmarks. The Dancing Fountains, the Burj Khalifa and the Burj al Arab in Dubai, and the Emirates Palace in Abu Dhabi also put the UAE on the podium. Travellers' Choice Awards top Middle Eastern attractions. June 2013: According to Trip Advisor, these are the world's top landmarks. What's missing from this list? Surely, the list is biased on a certain kind of audience. Cambodia appears twice, but there is little from Western Europe and nothing from the US. What is a landmark? Is it a recognisable icon that helps you to navigate or simply an impressive sight? June 2013: Super video that gives you a quick tour of the tallest building in the world, the Burj Khalifa in Dubai, visiting parts you'd never get to see as a tourist. Lovely short video on Dubai. Brash, rich, a dream built on a desert? Is this is the Dubai you recognise? The British Empire might not be as pink as it once once, but there are still beautiful corners of the world that can be called home. Here's some beautiful photos from the British Oversea's Territories. Our aim is give you travel advice and ideas into trips and holidays to make the planning a little easier. If your not sure where to head to next click below to get some inspiration on family holidays and expat life from our travel stories and ideas. Send us a postcard!